VSO PhotoDVD is the best choice of software to create elegant DVD Photo Slideshows of your photos. Share your digital pictures on a DVD with friends or family using any home DVD player or on the web. 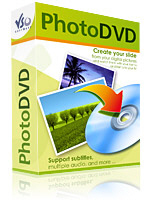 VSO PhotoDVD animates your images to make a video DVD Slide show automatically including a DVD menu. You can add optional soundtracks and comments to your pictures. The result is attractive and vibrant. The product is very easy to use and burn with any DVD writer.